The Quemetco lead smelter is owned by RSR Corporation, which is a Dallas, TX-based,Â privately held secondary lead smelting company that operates lead acid battery recycling facilities in California, Indiana, and New York . “…Based on its 2014 emissions, Quemetcoâ€™s HRA showed that it posed a cancer burden of 0.66 excess cancer cases primarily due to arsenic emissions. Under SCAQMDâ€™s Rule 1402 the facility must reduce its cancer burden to 0.5 or less. A cancer burden is a calculation of the number of total people estimated to get cancer due to a facilityâ€™s emissions over several decades. South Coast Air Quality Management District officials today formally notified Quemetco, Inc., that it must reduce its cancer risk to residents by ensuring lower arsenic emissions, a byproduct of the facilityâ€™s lead smelting operations.Â Within 30 days, Quemetco must notify about 12,000 residents near its City of Industry facility of the risk. Quemetco, located at 720 S. 7thÂ Ave. in the City of Industry, recycles lead-acid batteries in its lead smelter.Â Residents in portions of Avocado Heights, City of Industry, La Puente and Hacienda Heights will be notified of the health risk and an upcoming public meeting conducted by SCAQMD where the risk will be discussed. The meeting will take place in the next one to two months in the community near the facility. For more information on the facility see SCAQMDâ€™s web page atÂ www.aqmd.gov/home/regulations/compliance/toxic-hot-spots-ab-2588/quemetco. In 2013, SCAQMD required Quemetco to conduct a detailed study of its emissions and health risk called a health risk assessment (HRA) under the stateâ€™s Air Toxics Hot Spots law, also known as AB2588. In March 2015, the stateâ€™s health risk agency updated its cancer risk guidelines resulting in a five-fold increase in the calculated risk from arsenic for the same exposure level. The updated guidelines, approved by the state Office of Environmental Health Hazard Assessment (OEHHA), resulted from an extensive review showing that previous protocols had underestimated cancer risk primarily due to the increased susceptibility of infants and children to air toxics. In June 2015, SCAQMD began implementation of the new state guidelines as required by law.The higher cancer risk for arsenic increased Quemetcoâ€™s risk above SCAQMDâ€™s regulatory risk thresholds and triggered requirements for both public notification and risk reduction. Quemetco now has 180 days to develop a risk reduction plan showing how it will ensure a reduction in risk below required thresholds. Once approved by SCAQMD, Quemetco must achieve the risk reduction as quickly as possible, but no later than three years after the risk reduction plan is approved. Based on its 2014 emissions, Quemetcoâ€™s HRA showed that it posed a cancer burden of 0.66 excess cancer cases primarily due to arsenic emissions. Under SCAQMDâ€™s Rule 1402 the facility must reduce its cancer burden to 0.5 or less. A cancer burden is a calculation of the number of total people estimated to get cancer due to a facilityâ€™s emissions over several decades. Quemetco has also applied to SCAQMD for permits to increase its production by 25 percent and switch the fuel used in its furnaces from calcined coke to petroleum coke, also known as â€œpet coke.â€ However in order to receive these permits the company would have to demonstrate that the increased production and alternative fuel would not exceed any of the agencyâ€™s risk thresholds. SCAQMD will be initiating a public process later this year to develop an Environmental Impact Report on the proposed production increase and fuel change. SCAQMDâ€™s Rule 1420.1 â€“ Emissions Standard for Lead from Large Lead-Acid Battery Recycling Facilities has imposed strict controls for lead, arsenic and other toxic air contaminants including benzene and 1,3 butadiene at lead-acid battery recycling facilities.Â Since adoption of Rule 1420.1 in 2010, and through subsequent amendments to the rule, both the ambient and point source lead limits have been tightened by more than 90 percent. SCAQMD is closely coordinating its activities with other environmental agencies conducting environmental assessments and remediation, including the state Department of Toxic Substances Control and the Regional Water Quality Control Board. SCAQMD required Quemetco to conduct an HRA in the mid-2000s, which resulted in Quemetco significantly reducing its lead and other air toxic emissions and related health risk by installing an advanced pollution control system known as a Wet Electrostatic Precipitator. Air quality officials haveÂ told a battery recycling plant in theÂ City of IndustryÂ to cut its arsenic emissions after an assessment found they posedÂ anÂ increased cancer risk to 12,000 people. The South Coast Air Quality Management District on Tuesday gave lead-acid battery smelterÂ Quemetco Inc.Â 30 days to notify residents ofÂ Avocado Heights, City of Industry, La Puente and Hacienda Heights of their health risksÂ and six months to submit a plan to reduce arsenic emissions. Craig Moyer, an attorney for Quemetco, called the 2013 emissions levelÂ that exceeded cancerÂ riskÂ thresholdsÂ anÂ “outlier test” andÂ said the facility has reduced itsÂ pollutionÂ each year since. Air quality regulators emphasized thatÂ the higher cancer riskÂ atÂ Quemetco is notÂ from anÂ increase in emissions, but was instead triggered byÂ more stringent state guidelines. Those guidelines estimate cancer risk from breathingÂ arsenic andÂ other toxic air pollutants isÂ more thanÂ three times higherÂ than previously thought, even at the same level of exposure. The changes, adopted last year, reflectedÂ what scientists now believe was an underestimate of the health risks infants and children faceÂ from air pollution. The findings will affect the company’sÂ permitÂ applications before the air district, which seek to increase its production by 25% and toÂ operate around the clock. The company acknowledged Tuesday that it would have to take steps to ensure that expanding its production willÂ not increase the cancer risk. The air district said it would hold a publicÂ meeting in the next two months to inform theÂ community about health risks from Quemetco’s operations. After a similar health risk assessment inÂ the mid-2000s found an elevated cancer risk,Â Quemetco paid more than $25 million to installÂ an advanced pollution control system called a Wet Electrostatic Precipitator.Â Air quality officials say thatÂ equipment has significantly reducedÂ emissions of lead and other toxic air pollutants. Still, Quemetco has been cited several times in the last two years for violating emissions standards forÂ benzene, a carcinogen,Â and once for releasing too much arsenic, according to air district records. Quemetco spokesmanÂ Dan Kramer said its July 2014 arsenicÂ citation was forÂ an emissionsÂ violationÂ on a single day andÂ has not been repeated. He called theÂ benzene violationsÂ “a technical disagreement” with air quality regulators over the appropriate testing method. 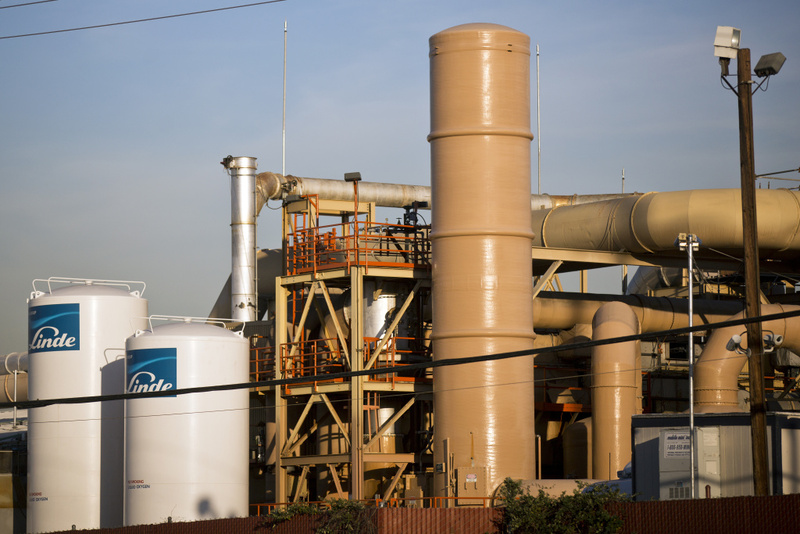 The latest findings of an elevated cancer riskÂ comeÂ more than a year after Quemetco’s main competitor, Exide Technologies in Vernon, closed down permanently to avoid criminal charges as part ofÂ a deal with federal prosecutors after years ofÂ lead and arsenic pollution. The state is now ramping up a massive effort to testÂ and clean thousands of homes near the shuttered ExideÂ plant. State toxic waste regulators have also required Quemetco to investigate lead contamination in surrounding neighborhoods.Â Starting this summer, state toxic waste regulators willÂ oversee an effort by theÂ company to test the soil ofÂ as many as 300 homes near the plant. The Department of Toxic Substances Control is reviewing Quemetco’s application to renew its hazardous waste permit, with aÂ decision expectedÂ by the summer of 2018. With the closure of Exide,Â Quemetco,Â which has operated in IndustryÂ since 1959,Â is the only remaining lead-acid battery smelter west of the Mississippi, according to the company. Wayne Nastri, a former industry consultant who was hired last month as the South CoastÂ air district’s executive officer, hasÂ recusedÂ himself from decisions about Quemetco because heÂ representedÂ Quemetco and itsÂ parent company, Texas-based RSR Corp.
Quemetco in the City of Industry recycles 600 tons of lead from batteries each day. Â CLICK HERE TO LISTEN TO AUDIO FROM THIS STORY – 0:42After three years of negotiating with state officials, the remaining lead battery recycler in Los Angeles County will soon begin testing soil for lead and other contaminants around its plant in the City of Industry, according to the state Department of Toxic Substances Control. Starting in early summer, Quemetco, Inc. will sample soil within a quarter-mile of its facility. That will cover more than 230 residential properties, more than 25 commercial/industrial sites and several public areas, including storm drains and the bottoms of San Jose and Puente Creeks, according to theÂ final workplan. If high lead levels are found and tied to the company, then the testing will be expanded up to a mile radius from the plant, an area that could include up to 1,000 homes, according to the state. So far only the soil sampling plan has been worked out. Quemetco is expected to submit the implementation plan for the testing to Toxic Substances Control by Friday. The goal of the sampling is to identify residential properties with lead levels higher than 80 parts per million and commercial sites with levels above 320 ppm. If Quemetco finds high levels of lead during the soil sampling the state will order a cleanup, which will require the development of a plan for that process, Lofstrom said. The company is paying for the soil sampling and will fund any necessary cleanup, according to the state. One issue that remains unresolved is determining the source of any contamination. Quemetco has asked the state for more time to create a new “fingerprinting” process â€“ which will determine where the lead originated. The company was supposed to submit a plan for it in January but requested more time. The protocol is now due Friday. Lofstrom said it doesnâ€™t really matter to the state if the company comes up with a fingerprinting plan, because unless it can prove it is not responsible for the lead, any cleanup will be its responsibility. Toxic Substances Control has invited the public toÂ a community meetingÂ on April 27 for an update on the sampling and testing plans. This is theÂ latest development in a decades long battleÂ between Quemetco and the state agency. Quemetco is the second lead battery recycler in the region to be ordered to test soil for lead. Exide, in Vernon, wasÂ shuttered by the stateÂ in 2013. Regulators are testing and cleaning up a 1.7 mile radius around the plant that could involveÂ up to 10,000 homes. In the City of Industry, the state first determined 25 years ago that there is lead in the neighborhoods around the plant. But it did not take any action at that time. Over the years, the Toxic Substances Control penalized the company for not disposing of waste properly and required it to clean up soil on the perimeter of the plant. Quemetco has also been cited by the Air Quality Management District and Los Angeles County in the past. In 2008, Quemetco installed equipment to drastically reduce its lead emissions. In 2012, Toxic Substances Control again found high levels of lead around the plant and ordered the company to submit a plan to deal with it. Quemetco and the state finally reached agreement last month on how to proceed in assessing what the state agency considers legacy pollution, spewed between the 1960s and the mid-2000s. The following guest post was written by attorney, Caroline Reiser, who is currently working at NRDC’s Santa Monica office for the Southern California Air Program. Located within 20 miles of each other, Exide Technologies of Vernon, CA, and Quemetco Battery Recycling in City of Industry, CA are the only two battery recyclers in the U.S. west of the Rockies. Both facilities recover lead from car batteries which they smelt into ingots and then sell. And that’s not all they have in common. As many in the local community have learned, both facilities have a long history of polluting which seems to finally be catching up to them. Without the right controls, the recycling process that occurs at Exide and Quemetco can release into the environment hazardous toxins, such as lead, a neurotoxin with effects on IQ and learning ability, and arsenic, a carcinogen. Not only are these toxins emitted into the air to be inhaled, they can also be deposited on the ground, accumulate in dirt, and be tracked into houses where they can then be inhaled or ingested. The South Coast Air Quality Management District (SCAQMD) regulates the pollutants released into the air, while the Department of Toxic Substances Control (DTSC) deals with the pollutants that end up in the soil.Â DTSC has a long and sorry historyÂ of ignoring the soil pollution caused by Exide and Quemetco, but in the last two years DTSC has been facing up to just how much damage Exide and Quemetco have caused in the surrounding communities. Soil testingÂ in 2014 of homes and schools near Exide showed lead levels above the California Office of Environmental Health Hazard Assessment’s screening level; some lead levels were over 10 times the screening level. DTSC announced in August 2015 that lead dust may have polluted as many as 10,000 homes.Â Admitting felony violationsÂ of federal law (the Resource Conservation and Recovery Act, or RCRA), Exide agreed in March to shut down the Vernon facility in order to avoid criminal charges. The company has also agreed to spend $38.6 million to clean up the facility and $9 million to clean the nearest homes, a process that was started in late 2015. Unfortunately, with sampling still to be done and Exide having declared bankruptcy, it’s unclear whether there is enough funding to complete the job. Extrapolating from the ongoing costs of home cleanups, the total bill could be in the hundreds of millions of dollars – money that neither Exide nor DTSC has on hand. Following the debacle at Exide, this year DTSC decided that Quemetco also needs to determine how much it has polluted its community. Over the last few months, DTSC and Quemetco have traded workplans laying out the process Quemetco will follow in testing for pollutants like lead and arsenic. DTSC, unsatisfied with the draft plan Quemetco submitted in August,Â finalized a planÂ on its own in October. Quemetco, however,Â opposed this October workplan, essentially because the company doesn’t believe it is responsible for all of the toxins located in the area. Lead, for example, can also be present in a community from paints and gasoline. Quemetco argues that it therefore unfair to bear the cost of testing for the toxins without first determining where any contamination originated. This seems backwards to us. DTSCÂ compromisedÂ with Quemetco and agreed that the company could start testing in a small area, a Ã‚Â¼ mile radius out from the facility. Only if high levels of toxins are found in this small testing area will the company have to continue sampling, expanding to an area of at least a Ã‚Â½ mile radius, if not more. DTSC has alsoÂ given Quemetco until early JanuaryÂ to finalize a chemical fingerprint technology, the process for determining if any toxin discovered originated from the facility. While it can seem obvious who the culprit is based on the location and high levels of a toxin, by looking at things like the particle size, types of contaminants, and weather conditions, it’s possible to determine more definitely the source of the toxins. Exide had complications with fingerprinting. DTSC originally caved to industry pressure not to use fingerprint technology at the Exide site, claiming it would be impossible to use. In the end, DTSC and Exide agreed to clean up first, and then figure out the fingerprinting. It’s encouraging to see that, unlike with Exide, with Quemetco DTSC has put its foot down and required the company to figure out the fingerprinting in the beginning. We’ll be watching to see what Quemetco suggests, to ensure adequate testing is done and that Quemetco and Exide clean up their act.